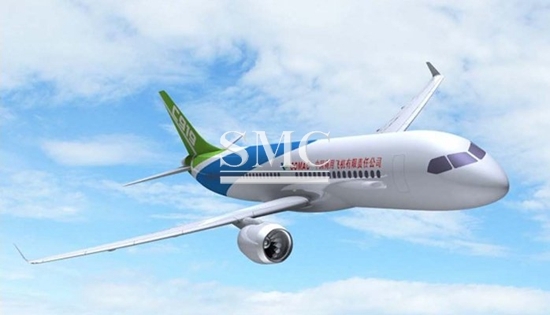 This year, China is introducing their first ever homegrown large passenger jet – Comac C919, that was entirely made in China. With planning that began more than a decade ago, this jet is intended to help promote a global sourcing model that is similar to Boeing Co. and Airbus Group SE. It is also supposed to help production efficiency and save costs. During this project, they wanted to take advantage of their resources as well as use the latest technology available. When building this jet, there were many technical breakthroughs that were developed during the building process. 85 percent of the tail section was made up of composite materials that required mould manufacturing and temperature control to help bring out these components properly. A majority of the components used were produced by Harbin Hafei Industry, an aviation manufacture located in Harbin, Heilongjiang province. China is just catching up in the aviation sector and had prior experience in manufacturing several aviation parts for different aircrafts. This project is a large step in their economy and aero industry. The C919 is a very large project that required an abundance of various components and manual labor. With the help of over 240 local Chinese manufacturing companies, the plan itself required more than 100,000 different components. There were over 460,000 people, all part of different sectors, which was used in the research and development behind the project. To further the research and development, there were over 37 high education institutions that were included as resources. The production of this jet has help drive the growth of the different industry chains and other manufacturing sectors. It is impressive to see China develop a jet that will be competing with the Airbus 320 and Boeing 737, especially because the country was underdeveloped just 40 years ago. In the past, the ARJ21 took about six to seven years to go through a series of test flights before it qualified for the airworthiness certificate. The C919 has already applied for its airworthiness certificate, and this time around, the test flight process is planning on running more smoothly and quicker. The jet just recently took off for the very first time in an hour long test flight. It was able to land properly and safely, and the flight was considered a success, but the jet still has a long process ahead. In the coming years, it is estimated that the C919 will bring in $15 billion in sales during its years of production.